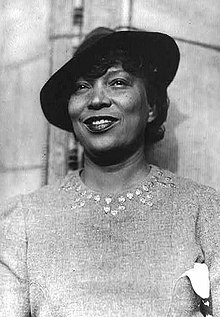 Zora Neale Hurston (lahir 7 Januari 1891 – meninggal 28 Januari 1960 pada umur 69 tahun) adalah novelis, penulis, antropolog keturunan Afrika-Amerika Serikat. Dia menerbitkan empat novel dan lebih dari 50 cerita pendek, naskah drama, dan esei. Namanya dikenal melalui karya novelnya berjudul Their Eyes Were Watching God terbitan 1937. Dalam tambahan edisi terbaru karyanya yang diterbitkan pada 1975, manuskripnya berjudul Every Tongue Got to Confess (2001), sebuah kumpulan cerita rakyat yang dikumpulkan pada dasawarsa 1920-an, diterbitkan sebagai penghormatan setelah ditemukan dalam arsip Smithsonian. ^ Boyd, Valerie (2003). Wrapped in Rainbows: The Life of Zora Neale Hurston. New York: Scribner. hlm. 17. ISBN 0-684-84230-0. ^ Hurston, Lucy Anne (2004). Speak, So You Can Speak Again: The Life of Zora Neale Hurston. New York: Doubleday. hlm. 5. ISBN 0-385-49375-4. ^ Boyd, Valerie (2003). Wrapped in Rainbows: The Life of Zora Neale Hurston. New York: Scribner. hlm. 14–17, 439–440. ISBN 978-0-684-84230-1. ^ Hurston, Lucy Anne (2004). Speak, So You Can Speak Again: The Life of Zora Neale Hurston. New York: Doubleday. hlm. 8. ISBN 978-0-385-49375-8. ^ Boyd, Rainbows, p. 25. ^ Boyd, Rainbows, p. 52. ^ Zora Neale Hurston, Zora Neale Hurston official website, maintained by the Zora Neale Hurston Estate and Harper Collins. ^ Zora Neale Hurston, Women in History. ^ Jones, Sharon Lynette (2009). Critical Companion to Zora Neale Hurston: A Literary Reference to Her Life and Work. Infobase Publishing. ISBN 0816068852. Diakses tanggal November 24, 2013. Abcarian, Richard and Marvin Klotz. "Zora Neale Hurston." In Literature: The Human Experience, 9th edition. New York: Bedford/St. Martin's, 2006, pp. 1562–3. Baym, Nina (ed. ), "Zora Neale Hurston." In The Norton Anthology of American Literature, 6th edition, Vol. D. New York, W. W. Norton & Co., 2003, pp. 1506–07. Beito, David T. “Zora Neale Hurston," American Enterprise 6 (September/October 1995), pp. 61–3. Beito, David T. and Beito, Linda Royster, "Isabel Paterson, Rose Wilder Lane, and Zora Neale Hurston on War, Race, the State, and Liberty". Independent Review 12 (Spring 2008). Boyd, Valerie (2003). Wrapped in Rainbows: The Life of Zora Neale Hurston. New York: Scribner. ISBN 0-684-84230-0. Ellis, C. Arthur. Zora Hurston And The Strange Case Of Ruby McCollum, 1st edition. Lutz, FL: Gadfly Publishing, 2009. ISBN 978-0-9820940-0-6. Hemenway, Robert E. Zora Neale Hurston: A Literary Biography. Urbana, Ill: University of Illinois Press, 1977. ISBN 0-252-00807-3. Hemenway, Robert E. "Zora Neale Hurston." In Paul Lauter and Richard Yarborough (eds. ), The Heath Anthology of American Literature, 5th edition, Vol. D. New York: Houghton Mifflin Co., 2006, pp. 1577–78. Jones, Sharon L. A Critical Companion to Zora Neale Hurston: A Literary Reference to her Life and Work (New York: Facts on File, 2009). Kaplan, Carla (ed.). Zora Neale Hurston: A Life in Letters. New York: Random House, 2003. Kraut, Anthea, "Between Primitivism and Diaspora: The Dance Performances of Josephine Baker, Zora Neale Hurston, and Katherine Dunham", Theatre Journal 55 (2003), pp. 433–50. Menefee, Samuel Pyeatt, "Zora Neale Hurston (1891–1960)." In Hilda Ellis Davidson and Carmen Blacker (eds. ), Women and Tradition: A Neglected Group of Folklorists, Durham, NC: Carolina Academic Press, 2000, pp. 157–72. Tucker, Cynthia. "Zora! Celebrated Storyteller Would Have Laughed at Controversy Over Her Origins. She Was Born In Notasulga, Alabama but Eatonville Fla., Claims Her As Its Own"; article documents Kristy Andersen's research into Hurston's birthplace; Atlanta Journal and Constitution, January 22, 1995. Walker, Alice. "In Search of Zora Neale Hurston", Ms. Magazine (March 1975), pp. 74–79, 84–89. Wikimedia Commons memiliki media mengenai Zora Neale Hurston. Zora Neale Hurston Trust official website. Writings of Hughes and Hurston from C-SPAN's American Writers: A Journey Through History. Halaman ini terakhir diubah pada 2 Oktober 2018, pukul 03.00.